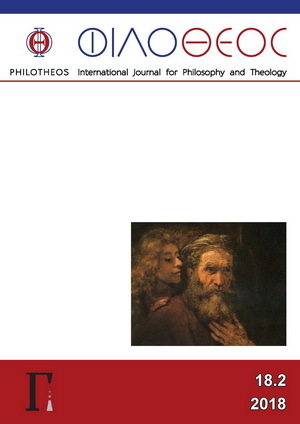 Philotheos (ΦΙΛΟΘΕΟΣ) is an international scholarly journal that provides a forum for a dialogue in philosophy and in theology respectively, with a special focus on the dialogue between the two. Founded in 2001, it brings together articles and book reviews of philosophical and theological interest in the broader Christian tradition. Contributions are published in several European languages and they cover diverse field of inquiry from antiquity to the present. The overarching goal is to overcome the disciplinarian entrenchments in philosophy and theology and reintegrate professional questions with the need to answer to problems placed before us by life itself. From 2001 to 2017 Philotheos appeared in one annual volume. Starting 2018 the journal has two issues per year, both in electronic and print formats. Philotheos is published by the Gnomon Center for the Humanities in Belgrade, in cooperation with the Sebastian Press in Los Angeles and the Center for Philosophy and Theology in Trebinje. Gnomon offers free read-only access to all Philotheos volumes. Full access is provided by the Philosophy Documentation Center.